Keep the chill at bay in a stylish way. This luxurious poncho offers a cozy-chic look that's second to none. Pair it with any ensemble to create added warmth and fashionable flair. Add flair to any outfit!! This poncho can be worn casual or dressy.. with ease...i would get more ..but i already have every color!! I absolutely love it! Its so comfy. I order different colors and I'm switching the fronts and backs to make it an entire new look. 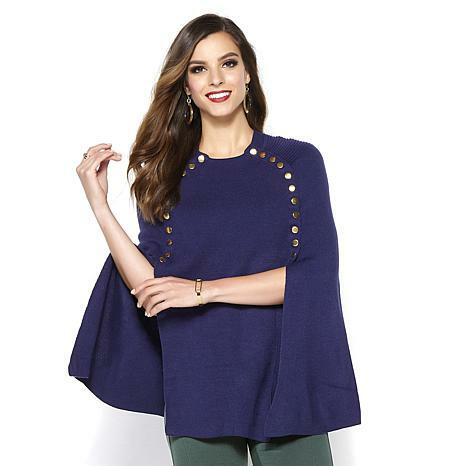 The style, weight, and color (navy) of the poncho is perfect. Getting it at a clearance price is almost irresistible! Imans fashions are classy and classic. I look forward to wearing the poncho along with the matching slacks I purchased. This poncho is a "Touch Of Class" Excellent Quality!..Love IT!..ordered 3 colors..